This spectacular Augusta floorplan with 3 bedroom (2 bedroom w/den), 2 bath, 2 car garage home is a must see! The spacious great room floorplan is perfect for entertaining. Living area with upgraded vertical blinds leads to the large screened extended lanai with pond view. Diagonal tile is throughout the living areas with carpet in the bedrooms. The chef in the family will love the gourmet kitchen with eating space, featuring 42 cabinets w/crown molding, glass cabinet, over and under mount lighting, tile backsplash, corian countertop, closet pantry & stainless appliances. Owner suite offers a large walk-in closet & bath has double sinks with tiled shower. Other extras include water softener and purifier, gutters, hurricane shutters and upgraded ceiling fans. Lighting in hallway and dining room has been upgraded as well. 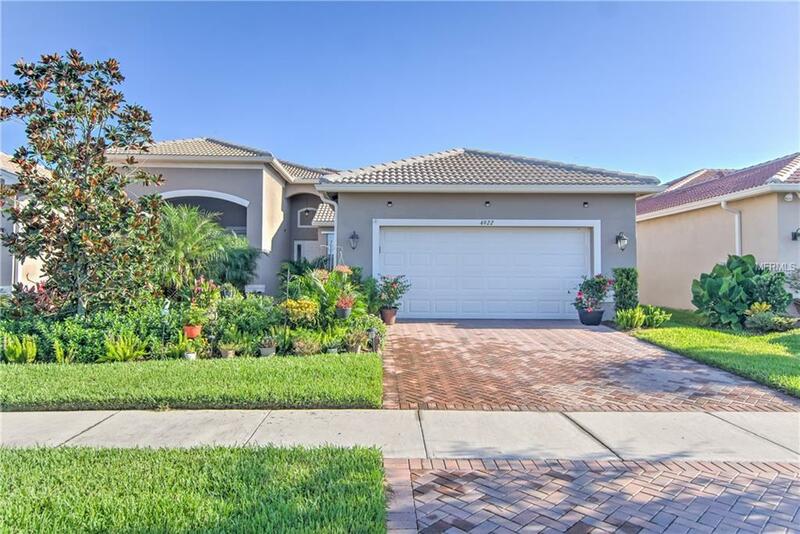 Located in the sought after, resort style, 55 plus community-Valencia Lakes. The waterfront outdoor recreation area includes resort style heated pool, lap swim area ,and resistance pool. Inside the resort style clubhouse you will find a huge social hall for events, aerobics, fitness, steam rooms, saunas, billiards, card room, internet caf, and more. The community also includes Har-Tru tennis courts, half court basketball, racquetball, horseshoes, shuffleboard, and bocce courts, dog park, baseball park, and RV / boat storage area. Convenient to Tampa Airport, medical facilities, shopping and golf. This premier community is located 30- 45 minutes from Tampa, St. Pete and Sarasota.